The R48 Featured on Network TV in Montana! Most important win in a tournament and most satisfying win in a tournament: Most important win was Alaska which pushed me into the top 12; and most satisfying was beating David Chapman in Des Moines, Iowa, to advance at my first pro stop ever. What are your goals in handball going forward: to play the best I can at the age I am—there’s not much time left. What are your goals for the R48/SR48 season: to give good results and showings for the people. Favorite handball tournament: The Los Angeles Athletic Club Wafe Reisner tournament and WPH Houston was a blast. How do you prepare for Race events: playing lots of Big Ball because of the top level competition there is and then mix it up with a little running. What do you love about handball: The people that are around it there always gracious nice and very kind. How would you describe your game: It all really depends on who I’m playing because I love to shoot. I use defensive when I know I can’t out shoot a player. Given the choice, what top R48/SR48 would you most like to play: I want to be in Utah as it invited player that would be cool. Who has inspired you to play this game at such a high level: It’s the same story Vince Munoz he’s the one that’s really developed me into the player I am. Chavez is fairly new to Big Ball handball but has already made a splash. Currently a small ball standout and former top six ranked pro, Chavez has made an exciting transition to the bigger ball and is winning tournaments with just a few years under his belt. Chavez may be one of the brightest handball minds on the scene and also one of the most driven. 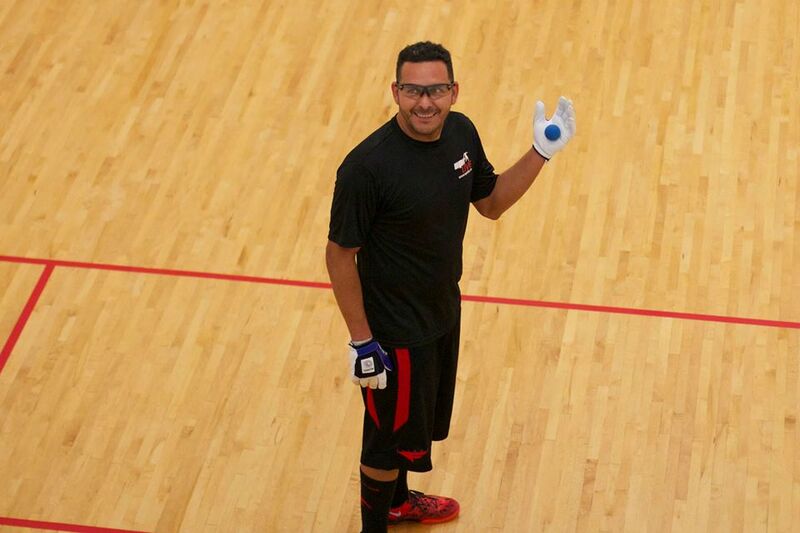 The WPH recently had the opportunity to chat with one of handball’s most dynamic personalities and showmen, Marcos Chavez. At 40, Marcos is the only player ranked on both the R48 and SR48 tours and Chavez is also a prominent fixture on the WPH 3-Wall Big Ball Player’s Cup Series. Hear what Chavez has to say about what big ball has done for his game, who he most wants to beat, how he balances family time and handball and much more! You’ve said that playing big ball has helped you to rediscover you love for handball. Why? Marcos: Small ball just became redundant with the same players within the last 15 years playing each other all the time. Going to watch the big-ball game one day really open my eyes to how many other players there are at the 3-Wall courts, so I tried it and got beat by a C player and that angered and inspired me to figure out the sport. A lot of handball players may not understand the difference between big ball and small ball strategy and technique. What are the differences and how are you able to adjust to both games so well? Marcos: First of all, the biggest difference in big ball to me is the pressure. Almost every big ball player at every level plays for money. I’m talking 10 to 20 dollars per game and to make it worse they play these games that last 10 minutes where everything counts aka rally scoring. So to me the fast pace and the way you can handle the pressure at the fast pace makes you learn how to adjust quick if you want to get good and not lose lots of money. You are currently the only player ranked on both the Race 4 Eight and Senior Race 4 Eight tour, demonstrating that 40 is by no means the end of the road for an elite player. How much satisfaction do you take from being a top player on both tours? In you last R48/SR48 stop you played nine matches in just over 48 hours and you appeared to be as fresh in the ninth as you were in the first. What is your secret? Marcos: Big ball is the secret. Playing with guys like Chris Tojin aka (flash), Samzon Hernandez and Angel Negrete. That’s the secret haha. You were ranked in the top five on the pro tour several years ago but virtually disappeared from pro handball in recent years, playing mostly local tournaments in Southern California. What motivated you to return to pro handball? Marcos: After my wife had our child, Gia, things at home came first but as my daughter gets older its not as difficult to leave. Also my father started a new business in which my brother Carlos, myself and my sister Gloria are involved, so I had to also make sure that was making money before I left to any tournaments. You seem to be playing some of your best handball over the past six months, defeating Ortiz, Fink, Selestow and Iglesias in tournament play and nearly defeating Peixoto (twice) and Nash. Would you say your game is as good or better today than it was during your pro tour prime? Marcos: I would say that I’m worse now but I never give up so I think that’s’ what I have going for me. All these young kids are missing the drive but I guess that’s what separates everyone. You are a proud member of the Los Angeles Athletic Club and you have a chance to spar with your protégés Mando Ortiz, Vic Perez, your brother Carlos and many others. What do they practice sessions do for you game? 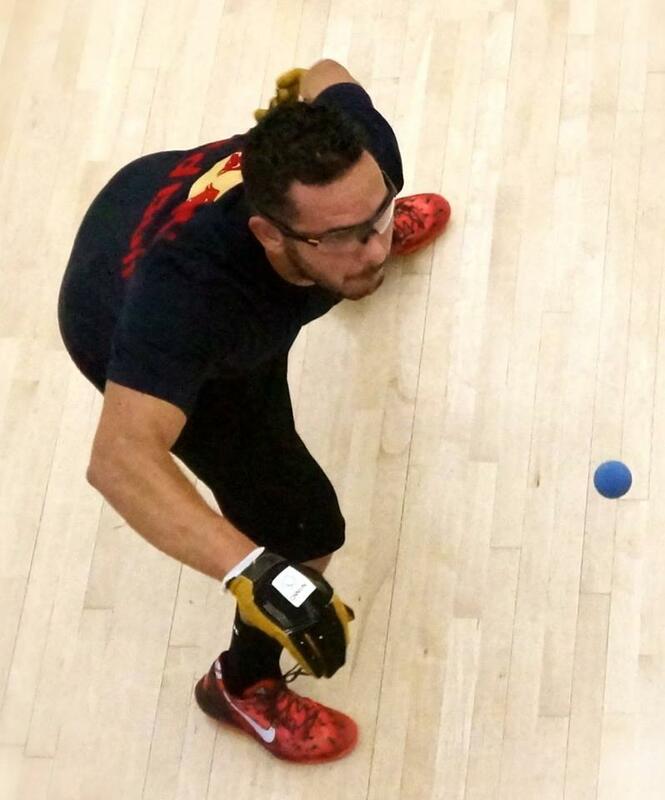 Marcos: Big ball really is the game I play at this point in my handball career but when I know I’m going to a tournament the LAAC is home and its the place to train to get my timing back and to see were I’m at with such long layoffs with small ball. The LAAC the best club in L.A. to train. Do you continue to play big ball during the small ball season, and if so, does that help or hurt your small ball game? Marcos: Playing big ball now for the last six years and does not affect my shoulders or anything with my small ball game. I’m so happy everything worked out haha. You were mentored by Vince Munoz and won a number of U.S. Open Doubles titles with him. What was the best advice that he ever gave you on the handball court? Marcos: Well as you know Vince does not say much on or off the court but being his partner has taught meant a lot. Those lessons include being strong, never giving up and the games are not over until 21. Those were the most important lessons that I took from him. Who is your favorite opponent to play on the R48 tour? SR48 tour? Big ball? Marcos: I like playing Fink and that’s just to beat him since my brother couldn’t but since I’ve done that already, I would have to say Emmett (Peixoto) is the guy I have to beat and Luis Moreno. I think I still have enough in my tank to pull a win from one of these guys someday. You are the proud father of a seven-year old. How do you balance running a business, being a husband and father and playing small ball and big ball handball on the highest level? Marcos: I get to work and finish my day at 4:00. It’s kind of early but its an established company so anything after 4:00 can be picked up by my employees and that gives me two hours to play big ball. The big ball courts are two minutes from my shop and it’s where all the best big ball players play so I’m very lucky. I leave around 6:00 and head home to be with the family by 6:20 and that’s almost an everyday routine. I would have to say I’m lucky.